Slim-N-Trim capsules are ayurvedic herbal appetite suppressant pills that help control hunger pangs and lower calorie intake. 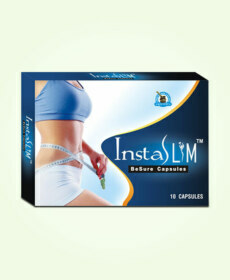 Buy Slim-N-Trim capsules online in India and promote healthy weight loss. People gain weight when there is imbalance between calorie intake and calorie burn, due to higher calorie intake body has unutilized calories which get deposited in body and promote weight. In order to shed weight one needs to reverse this imbalance and turn it into higher calorie burn and less calorie intake and maintain it for a longer period of time. This creates scarcity of calories which body fulfills by burning down deposited fat. 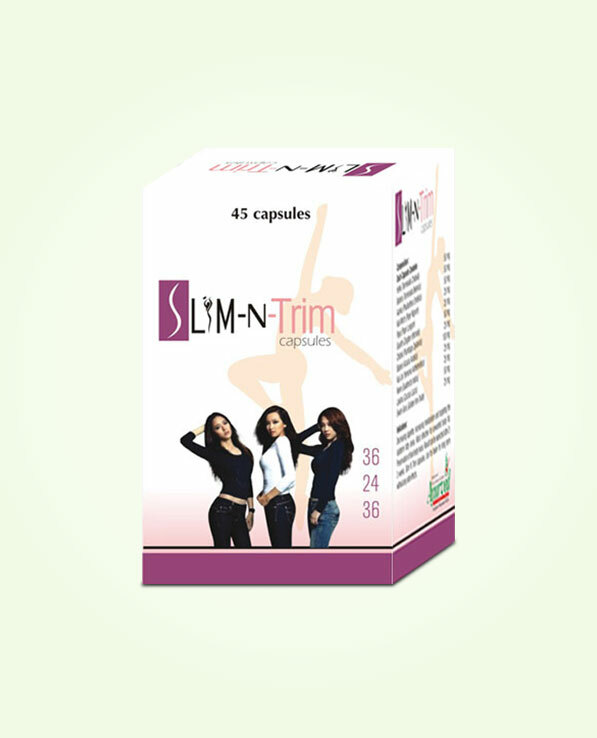 Slim-N-Trim capsules are recommended as very useful supplements to promote healthy weight loss. These herbal appetite suppressant supplements curb craving to eat more and frequent hunger, and lower calorie intake to promote fat loss. These herbal appetite suppressant pills do not cause any damage to digestive organs but reduce appetite and diet volume by pure natural effects. Slim-N-Trim capsules curb presence of toxins in blood which disturb hunger pattern and raise cravings to eat every now and then. These raise false hunger alarms and push a person to eat even when body does not need energy. These herbal appetite suppressant pills promote healthy fat metabolism to fulfill energy requirements and also supplement nutrients in bioavailable form, these nutrients enhance energy levels and also improve immunity to keep harmful agents from raising body’s toxicity levels. These ayurvedic herbal appetite suppressant supplements regulate bowel movements and reduce toxin level in digestive tract, these boost-up digestion and keep absorption rate of nutrients higher in the body by promoting flow of blood. These capsules possess herbs which burn fat faster obtained from diet and convert it into lean muscle mass, higher lean muscle mass promotes muscle mass which provides fitter and slimmer body. These herbal supplements support vital systems of the body to increase strength and stamina and also allow a person to exercise for longer duration. Slim-N-trim capsules possess herbs like Sonth, Kali mirch, Haritaki, Pipal, Bahera, Babool, Kaljiri, Amla, Chitrak, Swarna geru and others. These collectively promote secretion of healthy hormones, these hormones maintain higher metabolism and utilize all the nutrition to keep body active and energized. These are sources of antioxidants which prevent tissue ageing and also open-up blocked blood vessels to dissolve fat even from difficult areas like abdomen and waist. These herbal appetite suppressant pills possess only herbs which are completely safe and fit to be used by men and women of all ages. These do not cast any side effect even after prolonged use. Chitrak (Plumbago zeylanica), Bahera (Terminalia belerica), Aamla (Phyllanthus emblica), Haritki (Terminalia chebula), Kalijiri (Vernonia anthelmintica), Babool (Acacia arabica), Mirch Kali (Piper nigrum), Soanth (Zingiber officinale), Pipal (Piper longum), Neem (Azadirachta indica), Swarn Geru (Golden Iron Oxide) and Laksha (Cocus Lacca). Consume 1 or 2 capsules of these ayurvedic herbal appetite suppressant pills 2 times a day with milk or water for 3 to 4 months continuously to get rid of excess weight in a natural manner. Slim-N-Trim capsules have really worked in my sister’s case. She was able to reduce her weight up to 3 kg on consuming these herbal pills regularly for 2 and a half months. Now she is continuing the course further to see the desired results. These appetite suppressant pills have been really helpful in curbing my false hunger. 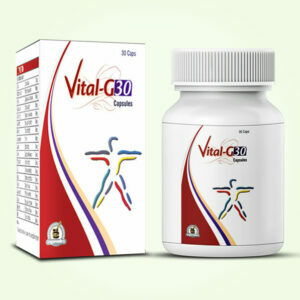 It increased my body’s fat metabolism and helped me reduce weight. I am still taking this supplement and looking forward to lose more weight and get in shape. Love this product. Body accumulates fat when energy requirements are low. My sitting job was making my middle broader and posterior heavy. I was looking like a mother of two at 24 years of age. This was depressing and even after regular walk in the morning and dietary control things were not improving. Inclusion of this supplement in a month brought changes which I was expecting. After three months of regular use I am slimmer and fit and my extra fat is gone. Now I wear tight clothes comfortably. Fantastic! You cannot starve yourself to shed weight it is dangerous, healthy weight loss is what that can give you health and attractive figure. This supplement gave me healthy weight loss. Not only my fat content was down but my muscle mass improved. My body is energetic and stronger and of course very much in shape. What may surprise you most is that it all happened with minimal efforts. These are natural weight loss pills work by making your system efficient and capable. Simply awesome!